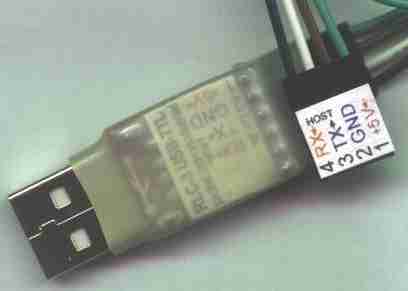 RLC-3: USB to TTL level serial interface converter. Like a standard USB serial adapter, the RLC-3 is connected to your PC via the standard USB connector, and driver software is installed to make it appear as a new serial port; accessible by any PC software which can talk to a com# port. Com port drivers are automatically installed with Windows XP / Vista (Microsoft WHQL certified) and are available for Macintosh OSX, Linux, WinCE, and Windows 2k / 2k3 / 7. Any speed: Baud rate from 300 to 1M (including 300 / 600 / 1200 / 2400 / 4800 / 9600 / 14,400 / 19,200 / 28,800 / 38,400 / 57,600 / 115,200 / 576,000 / 921,600) with a 576 byte receive buffer and a 640 byte transmit buffer promote fast and smooth data transfer. USB 2.0 compliance provides full speed data transfer on the USB side. No power needed: The unit is self powered from the USB port, and can actually supply a small amount of current for a target circuit (500mA at 5V or 26mA at 3.3V). RLC-1 RS232 Level Converter in a DB9 backshell for TTL <-> RS232 level conversion for a standard serial port. RLC-2 RS232 Level Converter in a DB9 backshell for ECS <-> RS232 level conversion for a standard serial port. Ground only this ground pin, TX and RX are needed for communications. TX Data send from the USB Host PC to the logic level (TTL) device. Your device should be listening for our signal on this pin. Before connecting the RLC, this pin should be "floating". +5 Volts. Unlike other RLC units, this device supplies +5 volts from the USB port. If the device you are connecting to is also trying to supply power, remove the wire from the RLC connector so they do not conflict. The pin order on the TTL connector is easy to change. Just slightly pry up the little plastic locking tab, and first push in, then pull out the connector by the wire. As noted in the table below, plugging things in backwards such that the +5 supply is grounded or so that a data pin is receiving a negative voltage can stress this unit past the point of damage. Please be certain of the signals on the pins of the device you are connected before you plug it in. We recommend a few quick measurements with a multi-meter (commonly available for about the price of the RLC3) with the meters ground lead on what you believe is your devices ground pin, and the meter set to measure low voltages. Then the TX pin of your device should read either 0 or close to +5 volts while the RX pin should "float" or change it's reading especially if you touch the pin with your finger. If you read a negative voltage at any point, then you don't have the ground pin. Pins 5 and 6 are not supported by the cable, but are present on the device. Pin 5 exposes a Reset signal which will restart the device if pulled low for more than 15uS. Pin 6 provides 3.3 Volts at up to 26mA. Custom units with a 6 pin cable are available. RTS and CTS are not available on this unit at this time. and functional operation of the devices at or exceeding the conditions in the operation listings of this specification is not implied. Exposure to maximum rating conditions for extended periods may affect device reliability. Notes: VDD = 3.0 to 3.6 V, 40 to +85 °C unless otherwise specified. 1. USB Pull-up Current should be added for total supply current. 2. The USB Pull-up supply current values are calculated values based on USB specifications. VDD = 3.0 to 3.6 V, 40 to +85 °C unless otherwise specified. Is your ttl to USB converter based on the Prolific 2303 chip series? I've tried several converters based on this chip and they don't reliably work with windows 7.